CubeFuture is pleased to welcome you to its inaugural show. Artist-inventor Gideon Cube-Sherman unveils the SNAAK. The SNAAK is formed of 64 cuboid sub units, with locking mechanism, held together by a central elastic biasing member. The SNAAK's design allows the user, by skilful manipulation, to construct more possible configurations than atoms in the known universe. The SNAAK's potential uses are numerous; ranging from technological designs, computing entertainment and telecommunication devices to jewellery and glow sticks. Most importantly, the SNAAK can create model buildings and cities of the near future. Eventually the world will be filled with SNAAKs for everyone to play with. 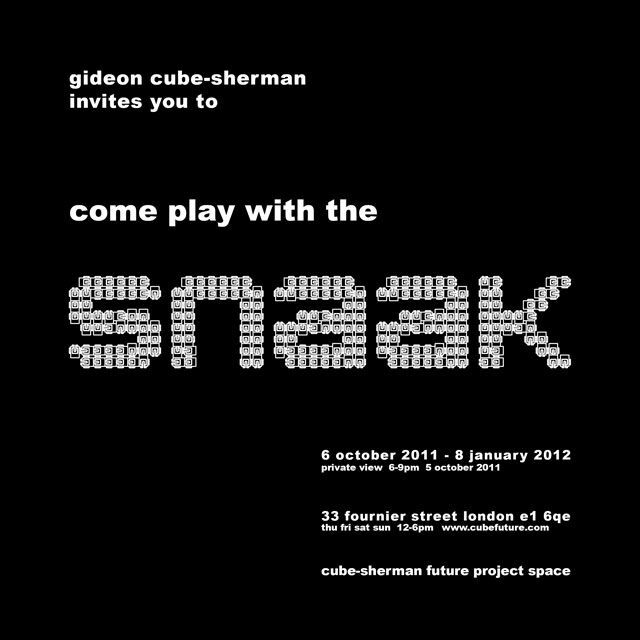 Publication of SNAAK MANIFESTO The patent documents for the SNAAK are published as a limited edition book.